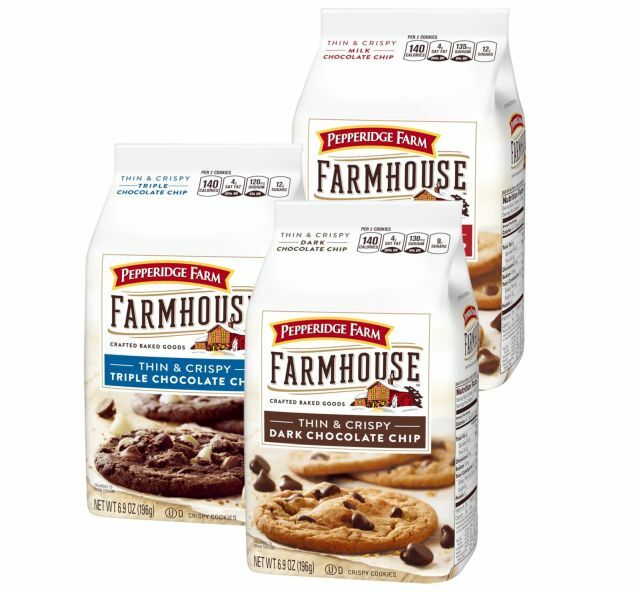 Pepperidge Farm introduces new Farmhouse Thin & Crispy cookies inspired by homemade cookie recipes and purposely made with fewer ingredients. The new cookies come in three flavors: Milk Chocolate Chip, Dark Chocolate Chip, and Triple Chocolate Chip. Each variety is made with 9 to 12 "real" ingredients with "real" meaning it's made with stuff you'd find in your pantry or fridge, like chocolate, flour, butter, sugar, brown sugar, eggs, baking soda, vanilla extract, and salt. You can find Pepperidge Farm Farmhouse Thin & Crispy Cookies nationwide at a suggested retail price of $3.49.